We’d been talking about visualizing and positioning a non-profit he’s working with. The intent of the organization is to provide the necessary elements for a metamorphosis of the members. All of us in the lunch bunch agreed that the word metamorphosis was a little too sophisticated for marketing purposes and as we talked we kept coming back to different interpretations of Ben’s statement. Rob our southern-friend brand guru chuckled and said, “Sounds to me like this choice thing is what you got to tell people about if’n y’all want to get ‘em to join up. ‘Minds me of a lady I once knew that had two or three butterfly tattoos flying up her back. She had a choice. And in my view it turned out right lovely. “And that is why we say Bubba is the Brand Guru. He understands the emotions that are at the heart of customer viewpoints,” I said. Don’t get trapped in the external symbols of a brand. The emotional content of your offer is what is remembered. How you say it is sometimes more important than the benefit you deliver. “…when in danger, when in doubt, run in circles scream and shout,” Bubba was saying as I joined the lunch bunch. I didn’t have to ask. “They don’t know what they don’t know. Their whole world is wrapped up in a perceived digital dialogue. Brand is the relationship an individual has with a product or service. The sum of all the relationships of all those folks is the brand. That takes into account that some folks don’t have a clue as to who you are, and what you do, and could care less right up to somebody who believes y’all are the breath of life. Digital doesn’t change that. Brand is still all about establishing trusting relationships. The digerati are just becoming aware of how fragile brand can be. Everything you do, every communication you have with a client or prospect impacts their viewpoint about your brand. Regardless of where they are in the buying cycle the relationship is ultimately based on trust. If’n you’re looking for a simple way to put it—Trust is not about words it’s about actions. So is brand. What you do is always more important then what you say. Theah’s some big words that supposedly are the foundation. Credibility is at the heart of it surrounded by authenticity, integrity and consistency. First I got to believe you. Don’t make no never mind if I’m buyin’, just kickin tires or just tripped and slud into your web site. Second, you got to be real. Don’t go makin’ promises you can’t keep. I know perfection is a mighty good thing to aim for but my target may not be what y’all are aimin’ at. Be honest. Don’t get wrapped around an axle tryin’ to be somethin’ for everybody. There’s gotta be some slack and most folks will give you a little credit, specially if you tell the truth. Brand is a matter of trust. Getting to trust means I have to believe in you, your product or service. Maintaining that trust requires you and all who represent you to be real, honest and constant. Keep your promises. Ken contacted me through Linked In and arranged a phone call. Would I have time for him in my schedule? How do you work? This one is sometimes a general interest question but if it comes after you’ve mentioned some accomplishment for a client means they want a taste of that for themselves. Why do you consult? At a cocktail party it can be an opening gambit but if it comes after you’ve revealed your years in practice or how you acquired your expertise to someone you’ve identified as a prospect… Remember, a prospect is someone that has a problem you can solve, is willing to talk to you and can sign the check to pay you. How many clients do you work with at a time? The clue phone should be ringing if you hear this. Always answer truthfully noting that although you are busy, you have room for another now depending on the time commitment required. What is your hourly rate? They are looking for a way to figure out what it would cost to put you to work for them. Do not answer directly. Yes, a lot of consultants and professionals work on an hourly fee basis and that is what the world expects. My recommendation is to work on a value based or retainer basis with all your clients. Value based means you agree to put together a plan just for the prospect based on the value they assign to solving the problem they have. Normally you will want to give them three options and let them choose. Option 1 solves their problem for an amount that is 10% to 20% of the value they assigned to solving the problem. Option 2 includes option 1 and adds a desirable add-on that will make the solution more effective. Option 3 includes options 1 and 2 and provides additional access to you for more complex and longer term fixes. Frequently, option 3 generates long term retainer agreements that allow you to provide your expertise on an on-call basis. That eliminates the requirement of developing huge proposals and all the time that entails. You still may have to map out how you’re going to handle something but it less of a pitch and more of jointly determined approach. Have you ever worked in my industry? Again, tell the truth. If you have, give them information on successes. Never get into industry politics. Always speak of former clients positively—even if you fired them or vice-versa. The real reason they are asking is their belief that their industry is different. People believe that their industry, state, profession etc. can’t be understood if you don’t work in it. Don’t argue. Instead tell them how you were a total newbie in some industry you have had success in. Explain how part of your approach is to first understand how the industry works and then solve the problem by bringing to bear all the people knowledge and processes you have come to understand working in a spectrum of industries. Or, if you are truly knowledgeable in a specialized area, give them facts, figures and success stories. All those questions just start the conversation. It’s up to you to take it to a profitable conclusion. If it is in a networking situation either personal or business get agreement to meet at their office. If someone is pitching you, Then decide when you want to schedule a follow-up based on the interest they show. Always follow up. Top sales professionals estimate that beginning and even experienced sales people miss out on 20% to 30% of potential sales just through not following up. Plan to meet with them face to face if possible. If a referral source is asking questions, carefully determine if they will tell you who they are asking for. If they will, orient your answers and questions to that prospect. If not, answer and question and suggest that it might be wise to introduce you to the prospect over lunch, on you, of course. Then, try to get that face to face meeting in their office. Never stop selling! Listen for the questions that suggest more than casual interest in your consulting capabilities. Pay attention to indications that there is real interest in what you do. Welcome back! It is good to see all of you again. How were the holidays? “New York for us,” put in Rick our Direct marketing master. “Yup, but it doesn’t keep the original date just the most recent time the file was modified, I replied. Laughing, Rick said, One of the most difficult lessons I learned early on was that you need to not only put dates on things but you also need to organize by client and project. When we opened we had no idea of how to keep track of things so we just had one list of project numbers. Client A Project 1 would get a number and then Client B’s project would get the next number and so on. Imagine what it was like trying to find anything in the real world much less on a computer. The way we solved it was to designate each client with a three letter code, each project with a number that was assigned serially that included the year and a letter for each version. You wind up with a file name like ABC 16-001 A. Works like a charm. I replied, “Good addition. That will also get you more cloud storage than you can imagine for a small consultancy and new capabilities to connect with others on your team and clients. We all have our Time Machines. Some take us back, they’re called memories. Some take us forward, they’re called dreams. Don’t forget about branding. 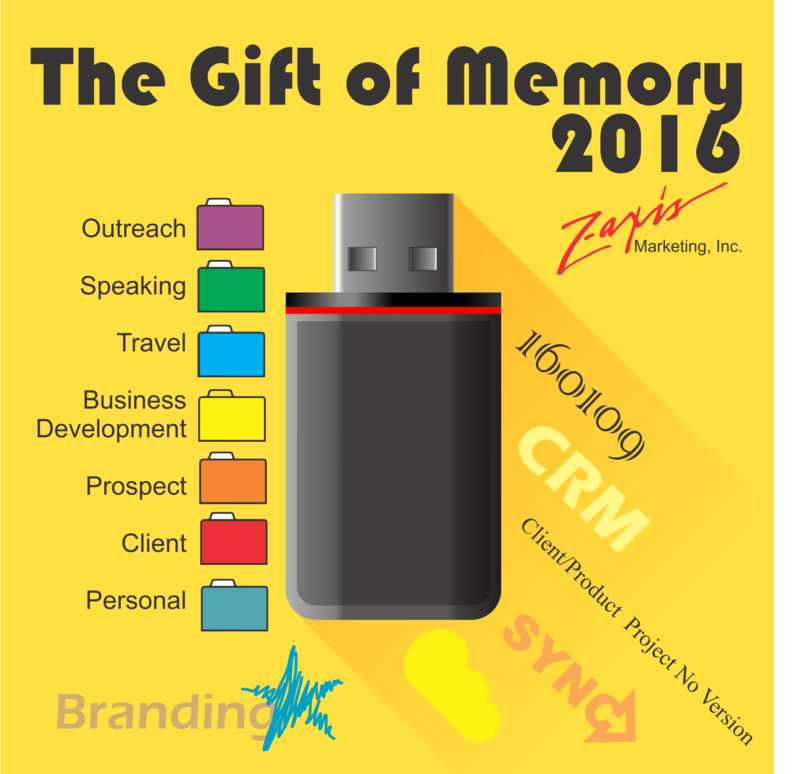 Build on the memory of your brand. Make your dream memorable in 2016. The Takeaway: The better organized you are the easier it is going to be to serve clients with imagination and innovation to make your brand memorable. Always find a way to be able to recover documents, graphics, presentations, etc. a year or two from now.